"Control Center" is a lightweight, yet highly efficient extension for Firefox that controls various YouTube playback parameters in order to enhance your experience. The extension has two primary building blocks. First one is the control center panel. When a new YouTube music is streamed, different playback parameters can be controlled right from the panel without the need to switch to the actual YouTube tab. 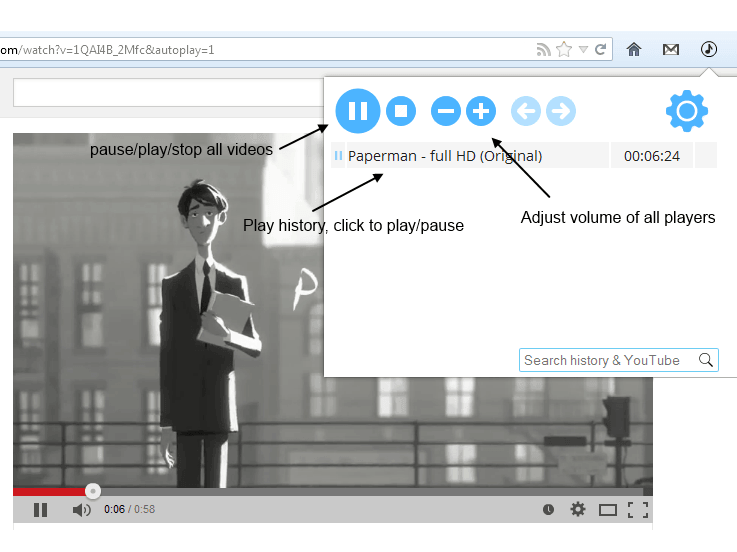 The second part of this extension is the controls that are injected in YouTube pages to change the UI and control volume, quality, and theme of the player. The add-on delivers a set of well-defined improvements and new features that benefit YouTube users and is minimally invasive. It is extremely lightweight and easy to configure, thereby it can be manipulated by anyone with minimum computer experience. The extension also inserts a little icon in the toolbar, which triggers a control panel for YouTube playback. Here, a history of previously watched videos will be kept, in addition to being offered a YouTube (or history) search function, controls for playback pause / resume and an option to adjust the volume. A higher level of control is provided inside the Options section, where you can configure the behavior of the add-on. This module allows you to set a preferred playback quality for all the videos, choose a color for player controls and for the progress bar, as well as to skip ads, enable or disable video suggestions, comments and buttons such as like, dislike or share and to auto-buffer clips even if the video is paused. Other options include auto-hiding playback controls when a video is playing, activate the loop function, disable keyboard controls and to auto-play videos then the player is loaded. The modifications you perform in the Options section do not require a restart, therefore you will be able to experiment with them immediately. What is the main differences between the XUL and WebExtension version of this add-on? Firefox: To add/remove the toolbar icon right-click on a free space in your Firefox toolbar and select "Customize...". To learn more about how to manipulate Firefox UI check a Comprehensive Guide to Firefox Customization on blog.add0n.com. Chrome: Simply right-click over the toolbar button and press hide in the menu. How to install the extension from source? Control Center extension is always evolving with new features. Many of these features are only available in the GitHub repository. To install a beta version, simply drag and drop the desired XPI file onto an open Firefox window and give it permission to install. There’s no need to restart the navigator in order for the changes to take effect. To find the XPI files, head to the GitHub repository. The latest beta version is located at https://github.com/inbasic/iyccenter/tree/master/src. How does Control Center manipulate the player? With Control Center extension, there are two levels of manipulation. The first one happens just before video page loaded. At this point, all the player's parameters can be altered. However, some of the features like auto-buffing video while video is in the paused state cannot be implemented in this level. Therefor, Control Center also injects an isolated script in all video pages. This scrip basically has control over all visual elements. Why Control Center is not working on embedded players? This is just a performance consideration. In fact Control Center should be able to perform on all players; however, to reduce its footprint currently the injection of script only happens for the official video pages.